Katie carries on the illustrious tradition with a modern twist. Her paintings are wonderful quality, her technique exciting and her love of the subject matter shines through. Katie O’Sullivan’s meteoric rise as a horse painter has been almost without parallel. 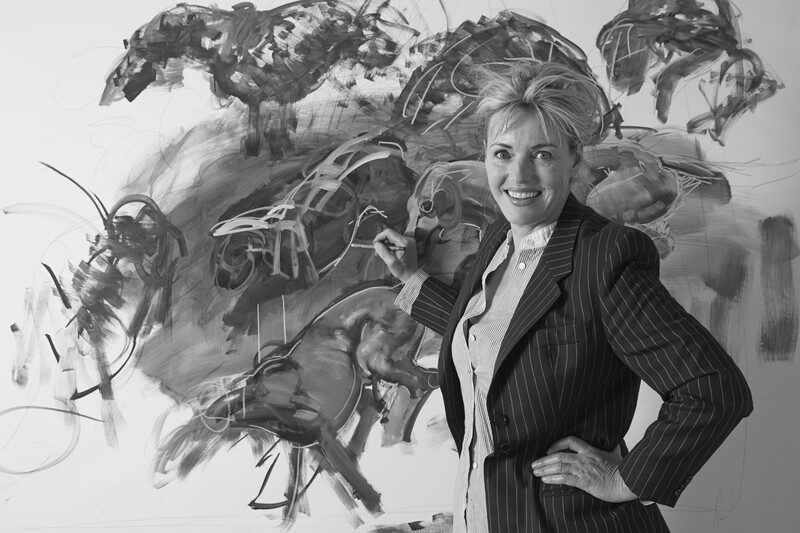 She is at the pinnacle of an extraordinary career and is considered by many to be the foremost equestrian painter in the British Isles. She was brought up steeped in horses in rural Ireland, moved to England and studied contemporary art at Chelsea School of Art. Her artistic talent was soon recognised, receiving the highly acclaimed Biddulph Painting Scholarship. Today, Katie lives and works in Lambourn, in the heart of English racing country, with her four children, her husband, racehorse trainer and former champion jump jockey Jamie Osborne and a multitude of dogs. From these inspirational surroundings, Katie continues to work on numerous prestigious commissions and has an extensive list of international, public and private collectors. A remarkable contemporary artist that demonstrates the enormous breadth of talent that combines the traditional values of painting with a modern flair.